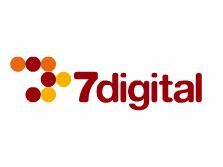 7digital, a small, UK-based music store, has made music history by becoming the first digital music service to offer DRM-free music from all four major record labels in Europe. 7digital will now be able to offer the catalogues of the so-called 'Big Four' - who share roughly 75% of the global music sales market between them - without imposed restrictions on file use. Digital Rights Management (or DRM) is a technology that controls the use of files downloaded from music stores. DRM-protected files - such as many of those offered by Apple's iTunes store - are essentially 'locked', meaning they can't be burned to a CD or transferred to another computer without authorisation. The technology was originally adopted by record labels looking to protect their music in the face of declining physical sales. However, DRM proved unpopular with consumers, who soon became irritated by the lack of flexibility. More recently, labels have been ditching DRM in favour of unrestricted files, and although Amazon MP3 already offers unrestricted music from the big four in the States, 7digital is the first to secure a European deal. iTunes, the world's largest online music store, currently only offers DRM-free files from EMI and a few indie labels.